Greek Finance Minister Yanis Varoufakis has unveiled his plan on reviving the Greek economy by both meeting the IMF requirements and circuiting the austerity measures. A preliminary agreement over proposal is expected on April 24. "Negotiations [with international lenders – Ed.] will be completed when we come to a decent agreement that will give a real prospect of stabilization and further substantial growth to the Greek economy,"Varoufakissaidin an interview to Naftemporiki newspaper published Monday.The minister also noted that his Cabinet won’t agree to carry out measures leading to a recession. Greece requires a new agreement with Europe to make its €324-billion debtsustainable, as now it accounts for178 percent of GDP, said Varoufakis pointing out five terms on which the plan is expected to work out. First, it is a reasonable level of primary budget surplus about 1.5 percent of GDP instead of 4.5 percent agreed by the previous government which has led to a severe recession. Secondly, it is a reasonable debt restructuring that will link payments with the growth rate of nominal GDP. In addition, Greece needs an investment package from the European Investment Bank and the European Investment Fund, which should be placed mainly in the private sector in accordance with the new, non-bureaucratic procedures. Fourth, Greece should pass on effective restructuring of troubled loans by allocating them to a ‘Bad Bank’ unlike other resources of the Fund for financial stability. The fifth thing is significant reforms that will give support to creative people and businesses that produce tradable goods, with export prospects, he added. Greece expects to reach a preliminary agreement with creditor countries on financing the economy and the external debt at a meeting of eurozone finance ministers on April 24, Varoufakis said. "Preliminary results will be achieved at the meeting of the Eurogroup on April 24," he said adding that Greece expects to negotiate the unblocking of the last tranche of €7.2 billion from the EU loan program, and to negotiate restructuring of external debt by June. The Greek authorities have also said they would pay a $450 million tranche of the IMF on April 9 and start a dialogue on economic issues, said the head of the IMF, Christine Lagarde Sunday after a meeting with Greek Finance Minister Yanis Varoufakis in Washington. 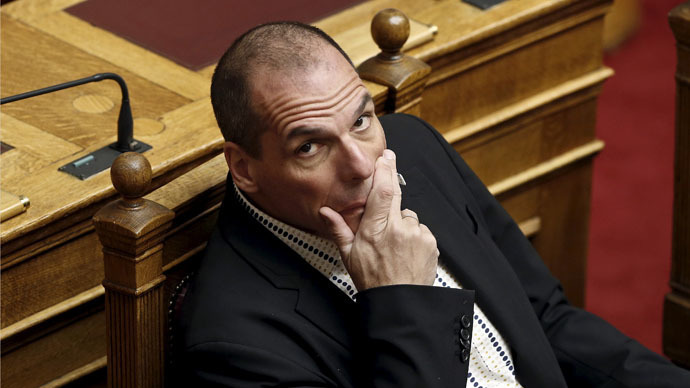 Varoufakis, in turn, said the country intends to fulfill "all the obligations with respect to all the creditors. Both Lagarde and Varoufakis agreed that the uncertainty about Greece's ability to repay debts is not in the interest of Athens. Earlier, there were fears that Greece wouldn’t be able to meet the next $450 million repayment of the IMF loan. Greece and its international lenders have been at a dead end negotiating about Athens’ debt. The Troika of creditors insists that Greece sticks to the austerity measures in order to meet all its commitments. Varoufakis says the austerity policy contravenes the election pledge of the newly elected government and demands the international creditors made concessions in restructuring the Greek debt.